ResearchSpeak: how bad is your end-organ damage? *Hypothetical, these have not been discussed widely in the MS community. We need a PROM in the NEDA definition to engage pwMS with the concept of monitroing their own disease. Jeffery et al. 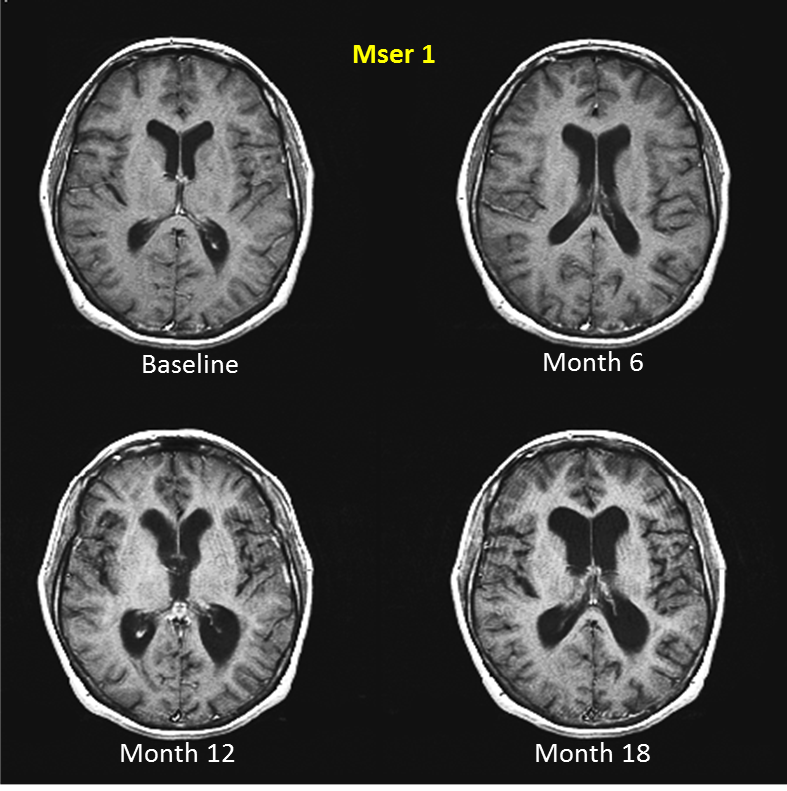 The relationship between the rate of brain volume loss during first 24 months and disability progression over 24 and 48 months in relapsing MS. Journal of Neurology February 2016, Volume 263, Issue 2, pp 299-305. Background: Clinical evidence in patients with relapsing-remitting multiple sclerosis suggests an association between MRI outcome measures and disability progression (DP). Objectives: Post hoc analysis to investigate the association and potential predictive value of brain volume loss (BVL) with long-term DP in FREEDOMS. Methods: Patients were categorized into quartiles by SIENA-calculated percent brain volume change from baseline to month (M) 24. Patient characteristics at baseline were determined for each quartile, as were the proportions of patients at M24 and M48 reaching Expanded Disability Status Scale (EDSS) scores of ≥4.0 or ≥6.0 or DP confirmed at 3 months (CDP3) or 6 months (CDP6), and change in EDSS and Multiple Sclerosis Functional Composite. Results: MS disease activity and severity as well as brain volume at baseline were predictive of subsequent BVL over 24 months. The quartiles of patients with greater BVL at 24 months were at highest risk (odds ratio, p value) for reaching EDSS ≥4 (2.8, p = 0.001) or ≥6 (5.73, p = 0.0005) and experienced more DP at M24 (CDP3 2.13,p = 0.002; CDP6 2.17, p = 0.003) and M48 (CDP3 1.98, p = 0.006; CDP6 1.87, p = 0.018) compared to the quartile of patients with the least amount of BVL. Conclusio CoI ns: These findings confirm the clinical relevance of early brain volume changes for long-term DP. "Don't we want to suppress MS disease activity as much as possible and protect the end organ (brain and spinal cord) from damage?" Philosophically speaking (phenomenologically to be exact), all available treatments suppress the indicators of MS disease, not the disease activity itself. After all, the latter is still unknown. To think that reduction of the signs achieves inhibition of the pathological mechanisms at work is simply wrong, The relationship between damaging processes and their demonstration is not 1-1. Simply put, by turning off the car engine overheating indicator you don't cool the car engine. Re: "Simply put, by turning off the car engine overheating indicator you don't cool the car engine." Nice analogy, but it cools and become cold with time. 75% of the variance in relationship to disease progression (EDSS) can be explained by new T2 lesions over a 2-yr period and brain atrophy in year-2. This data was from a meta-analysis of 13 phase 3 clinical trials. Although it is group data it is describing biology. To have the greatest impact on disability progression you need to suppress focal inflammation (new lesions) and slow down brain atrophy as much as possible. That is why NEDA-4 is an important treatment target. By the way VV is nice to have you back on the blog; you have always been a very astute critic and make this blog interesting. Disease progression measured by EDSS, lesions and brain atrophy are all indicators of unknown pathological mechanisms. Attempts to manipulate one in favour of the other is just implementation of circular reasoning. As long as the core process of MS remains elusive, messing with the signs alone is all but meaningful. As one once said, it is like shooting darts in the fog. Aren't we all in the "damage control" industry? Philosophically speaking (practically speaking that is), one is better off spending one's time maximising one's likelihood of less damage for the longest period of time (i.e. damage control) by comparing the existing treatment options and selecting the best available at a given point in time. I appreciate your contribution as well, but would invite you to focus your energy where it matters rather than bashing everything pharma. Let's say that while walking barefoot you step on a very thin needle, that goes all the way inside your foot. Later your foot becomes swollen and painful, but you are unable to find that foreign object inside it. Would you ever stop searching for it and go for painkillers and immune modulators to relief your symptoms? Who says what matters in a disease of unknown aetiology? To the point, brain volume is an indirect measure of brain mass which would be an indirect measure of the amount of neurons present. Still, what we need to know is the integrity of the existing neurons. Therefore, measuring brain volume could be wide off the target. And how is DP measured? By EDSS, which is subjective and has been widely accepted as an inadequate scale focusing too much on mobility. So, did the researchers prove something objectively significant? No. Thanks for info on NEDA. What is your theory as to why Gilenya failed to stop progressive disease when it sequesters both B and T-cells in lymph nodes. Also, what are your thoughts on the failed Rituxan intrathecal trial in progressive patients? It did not reduce B-cell activity in the brain effectively, as I understand, and did not decrease neurofilament levels and they therefore pulled the plug? Do you think that we need just a better medication or monoclonal antibody medication to destroy B-cells/plasma cells in the brain? How does Cladribine fit into this picture in progressive MS as it is more "brain accessible" to lower B and T cells? Progressive MS is nothing to do with T and B cells is one simple explanation. Fingers crossed on Cladribine trials. One study (http://www.jneurosci.org/content/36/4/1336.short?sid=785a549b-e26e-474e-a552-30ddedb0c650) stated microglial and platelet activating factor were responsible for neuronal destruction/progressive disease in EAE mouse model independent of the demyelination/inflammatory white matter lesions. Is there any medication/monoclonal antibody developed that attacks or dampens the effect of microglial cells or platelet activating factor? Sorry for all the questions. At present there is no trial. Merck have or are going to the regulators with current knowledge to get approval without doing more studies. As to trial to address your point, it needs to be funded. The sample size calculations are done. Who will fund? If a patient is on a DMD and is NEDA 1, 4 and 7 but not NEDA 2 and 3 after a year. Would it be an idea to consider changing DMD? NEDA 5, 6 and 7 unknown. Sorry should read NEDA 5, 6 and 8 unknown. If you are positive neda 2 5 or what ever then you are not neda. At present only neda 123 are in the hierarchy supporting change neda 4 5 is atrophy marker what do you change too. Are you saying that being Neda 123 means that you shouldn't change whatever you are doing, medication or other, that ensures this result? I'm asking because I was Neda 123 for 3 years after my first relapse and I recently chose to start Copaxone to better control remaining symptoms and prevent progression. I'm having second thoughts as to whether that was a good idea.. Hunting for grey matter lesions.